And so the journey in the wilderness begins. The juxtaposition between the events of yesterday and the hard work that even now the Church of England is undertaking with caution and prudence - the defiant images (and they are purposely crafted) that are being sent back across the Atlantic to the Archbishop of Canterbury are simply breathtakingly grievous. Like Rhett Butler's remarks to Scarlett O'Hara at the closing scenes of Gone With the Wind, yesterday's events mark not just another dramatic occasion for the Episcopal Church to demonstrate its transition to political activism as the "new liturgy," but also presents an unwavering public demonstration that, when it comes to the relationships and bonds with brothers and sisters all over the world in the Anglican Communion, the leadership of The Episcopal Church quite frankly does not give a damn. I stand by my prediction from yesterday, the Sun rose and set, the consecration went forward, the Continuing Episcopalians got their knickers in a knot and not a damned thing changed! I do beg to differ, my friend. It's hardly defiant to send a message like this to rowan. You have to defy someone to be defiant. I was reminded of an event at the Lambeth Conference when I saw these pictures. When Rowan Williams made his final address to the Lambeth Conference, he was met with many standing ovations. 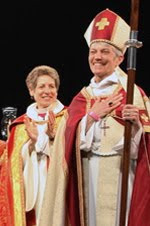 Bishop Schori was not one of those who gave him an ovation. While at some point she stood up, she did not clap but stood defiantly as fellow Episcopal bishops walked out during the Archbishop of Canterbury's address. When I see these pictures, I am reminded of that moment. Alas, anon, appreciate your opinions but maybe it would have been better to keep that one to yourself - however we may disagree (and sometimes strongly so) with the bishops in these photos, they are still loved by God and we should remember that. Again, friends, let's remember that there are others sitting at the tables. If we call people names, then we may end up having a bar room brawl - though it appears that Hagrid has taken two regulars over to the side by the bar to have a little chat. John did raise one question, sorta, and that is why should we care (that's taking out some of the unfortunate name-calling). That actually is a good question - why do we care? We care because we love The Episcopal Church and for all that has happened - we are still family, either as Episcopalians, Episcopalians in exile, Anglicans, or Christians. The actions of one affect the actions of others. The family is fracturing - a reality we all must at some point face. With respect, this all seems a little separated from reality. The "images" I see are of understandable joy and celebration - such as is appropriate at a consecration - not "defiance". It was a joyful occasion! And I (along with the vast majority of faithful Episcopalians) am also filled with joy, not just for the diocese, but for my church whose leaders finally seem to have found the guts to stand up to all the blackmail and intimidation from Canterbury and other parts of the Communion's leadership: to simply do the right and moral thing, taking a stand for justice and the kind of inclusive open-to-all community taught by Jesus, and against the theology of ignorance, hypocrisy, prejudice and exclusion that so betrays the Gospel message. Let's be real. Once one gets beyond the familiar conservative "spin" on all this, the simple fact is that TEC leadership has over the last few years consistently behaved with an amazing (and often infuriating) degree of deference and respectful openness to dialogue with those (in the church and in the broader AC) who seem so irrationally and monomaniacally obsessed with opposition to permitting gay bishops and blessing-rites for same-gendered relationships. TEC's main fault was in EVER agreeing to comply with the immoral demand for "moratoria". This was an act of "bad faith", because most of our leaders knew in their hearts it was wrong. TEC has now (praise be to God) simply, through God's grace, ceased to "obey" a totally inappropriate set of "commands" from the Communion leadership that it acquiesce in continuing policies that a majority of who make up the church have experienced God telling us to be contrary to God's call to love and justice. In contrast, a majority of the worldwide AC - or rather its leadership - have consistently acted throughout arrogantly like a bunch of school-yard bullies, refusing to admit any possible value to any view of God's plan beyond their own narrow orthodoxy. They have never really asked TEC for respect, dialogue or "mutual affection" - which they have always had, and continue to have. What they wanted, demanded and attempted to extort from TEC was (and is) unquestioning servile obedience, "repentance" for having responded to God's call, and an abandonment of moral principle. If the "bonds of affection" continue to be strained, it is (and always has been) the closed-minded (and totally unloving and disrespectful) insistence of conservatives on imposing their own way on everyone else that truly strains it. What universe is this fellow living in? Their arrogance is only exceeded by their dearth of theology. Mr. Schwarz -- I am a bit confused. First, you accuse the conservatives of being "irrational" and "monomaniacal" in not responding to TEC's "amazing (and often infuriating) degree of deference and respectful openness to dialogue" over the past few years, but then you admit that TEC in agreeing to comply with the moratorium was basically a "bad faith" liar during that same period. Packing so much anger into one comment tends to trip up the thinking, I have found. 7. notes the significance of the Kuala Lumpur Statement on Human Sexuality and the concerns expressed in resolutions IV.26, V.1, V.10, V.23 and V.35 on the authority of Scripture in matters of marriage and sexuality and asks the Primates and the ACC to include them in their monitoring process. BB -- How dare you respond with such ignorant, hypocritical, prejudiced, exclusionist, irrational, megalomaniacal, arrogant, school-yard bullying, narrow, closed-minded, unloving, and disrespectiful spin. Consider one of the most basic definitions of "Communion" as a body of Christians having a common faith and discipline , and the fact that the overarching constituency of the AC has begged for American restraint in the ordination of avowed homosexuals; I'm forced to ask hard questions. Does the American church even care for the concerns of the Global communion, or have they become so petulant that they care only for their own instant gratification? And, at this point, does the American church truly desire to remain a part of the Global communion? I ask these because the old saw is true: Actions do speak louder than words. If the TEC is happy with their new status quo, they should tell the communion to sod off. The communion in-turn, should politely show 815 and the American church the door. Don't come as no suprize to us iggorant ole "Affirmation of St. Louis" boys...! "What they wanted, demanded and attempted to extort from TEC was (and is) unquestioning servile obedience"
Obedience to God. Remember Him? While we're re-posting 1.10, let's also check out the August 5th, 1998 Pastoral Statement to Lesbian and Gay Anglicans from Some Member Bishops of the Lambeth Conference signed by 146 bishops (8 primates - one of the bishops being the then bishop of Monmouth) in response to 1.10. "We call on the entire Communion to continue (and in many places, begin) prayerful, respectful conversation on the issue of homosexuality. We must not stop where this Conference has left off. You, our sisters and brothers in Christ, deserve a more thorough hearing than you received over the past three weeks. We will work to make that so." 2. affirms that it is deemed inappropriate behaviour for any bishop or priest of this Communion to exercise episcopal or pastoral ministry within another diocese without first obtaining the permission and invitation of the ecclesial authority thereof." "A fellow-Christian may believe they have a profound fresh insight. They seek to persuade others about it. A healthy church gives space for such exchanges. But the Christian with the new insight can’t claim straight away that this is now what the Church of God believes or intends; and it quite rightly takes a long time before any novelty can begin to find a way into the public liturgy, even if it has been widely agreed. Confusion arises when what is claimed as a new discernment presents itself as carrying the Church’s authority. And that’s why the pleas for continuing moratoria regarding certain new policies and practices have been uttered. Such pleas have found wide support across the range of views represented in the indaba groups. The Church in its wider life can’t be committed definitively by the judgment of some; but when a new thing is enshrined, in whatever way, in public order and ministry, it will look like a definitive commitment. The theological ground for a plea for moratoria is the need to avoid this confusion so that discernment continues together. The Resolution of Lambeth ’98 was an attempt to say both ‘We need understanding and shared discernment on a hugely complex topic,’ and ‘We as the bishops in council together are not persuaded that the new thoughts offered to us can be reconciled with our shared loyalty to Scripture.’ Perhaps we should read that Resolution - forgetting for a moment the bitterness and confusion around the debate and acknowledging that it remains where our Communion as a global community stands - as an attempt to define what a healthy Church might need - space for study and free discussion without pressure, pastoral patience and respect, unwillingness to change what has been received in faith from Scripture and tradition." About four years ago our church split. CANA we were told was the true direction for our church. This from friends that hid donations and their true affiliations prior to the split. Enough. We have had enough. We have had enough of name calling and distortions of our beliefs. We have chosen to serve and worship our Savior, Jesus Christ, in the Episcopal Church. We are not perfect. We know that but we have chosen, after much discussion and prayer, to accept all people no matter what their sexual orientation to come and worship with us. One day we will all know who chose wisely. I do think it's more about repentance and mercy - God does have a track record with prodigals, whomever they may be. 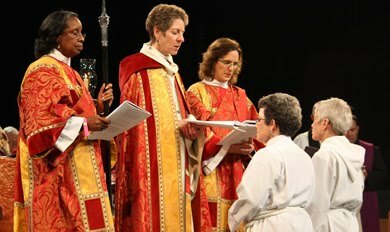 The old, western-oriented Anglican Communion is now well and thoroughly dead. You've said you were reminded of an event at Lambath (past) scolded for unkind postings, and posted documents from the past. But what has changed? What is different today from last Tuesday? TEC is still TEC and I seriously doubt any real action will be taken by Canterbury. I'm with 1662 BCP and Londoner on this one. Well Anon, you could be right on one account; if the "western-oriented" (Anglo-Canadian-American) wing of the communion continues to play the Laodicean hand, they may find themselves as being Spat across the room... And that, is a position most unenviable. Some of the actions are in diplomatic exchanges which are underway. They are sensitive exchanges and so not exactly bloggable. What is important for us to remember is that we should not harden our heart - even toward the prodigals among us. You see, God loves the Episcopal Church because He loves the people in it. He has a track record of leaving the 99 to seek the lost one. So it's not just "what" we do that matters at this point, but "how." It is not anyone's great interest to have a strong centralized power - no matter how much many in our midst continue to call for a "king" - and I admire Rowan's fortitude in not being made a "king," especially by the last people on earth who need one when we've got one all ready. Our focus should not be on the Archbishop of Canterbury, who needs our prayers and love and support, not condemnation - but on the King of kings who knows exactly what is going on, can know and search people's hearts (something we are not able to do) and is fully aware of who is following Him and who is not. As we form relationships - and this is my experience at this time - it is very very surprising what is actually happening "on the ground" as opposed to what is happening in these media events designed to initiate political social change. The lack of enthusiasm at the turnout in LA is something that should cause us all to pause and consider. One hopes that the leadership of TEC - someone, somewhere - is taking a long hard look at that and reflecting on what is actually happening (or not happening) on the ground. But if we harden our own hearts and get into mode that some are simply unsaveable, we will have a lot more to deal with since it's clear God has no intention at this point on giving up on ANYBODY. That's why it's called Good News. We should follow His example, even in the bleakest hour and do likewise. If Lambeth resolution 1.10 is to be the standard and foundational understanding of homosexuality by which the Global South and ACNA/ANiC are going to try to build an orthodox community, they will surely fail. Lambeth 1.10 affirms and lends credence to agenda-manufactured concept of 'sexual orientation' which is fictitious, not proven by research and is entirely unscriptural. The Scriptures recognizes only two orientations (repentant/obedient and turned toward God and unrepentant/disobedient and turned away from God) and two sexes (male and female). The Scriptures do not recognize any exemption on the basis of our desires, perceived identities or conditioned responses. God is a great egalitarian all right, we all begin with abject surrender of our former identities and receive the new creation identity won for us by Christ. Re-read and meditate upon the inclusiveness of Romans 1:18-32 and I Corinthians 6:9-20. No proclivity is offered exemption or exclusion in the invitation to repent and come to God through Jesus Christ. All sin has been defeated and stripped of its power by the Cross, Blood and Resurrection. Hebrews 7:25, Galatians 5:24. BTW and just curious, but who are the Bishops accompanying +KJS? My point above is that Lambeth 1998, Resolution 1.10 is a forced and unfortunate compromise of both Scripture and Tradition and of factual reality. Well, it's really more than an unfortunate compromise, it's a fatal one. "Some of the actions are in diplomatic exchanges which are underway. They are sensitive exchanges..."
Well, if you mean that ++Rowan is caught between a rock and a hard place and is trying to wriggle out, you may have a point. Clearly, he is trying to find out from Gafcon the least he can do without their breaking communion with him, and finding out from Canada and New Zealand the most he can do without them walking with TEC. Unfortunately, those are mutually exclusive positions. And each day of silence from Canterbury widens the gap between them. On the matter of "assertions", Londoner, look to the beam in your own eye. To those who feel TEC's direction is a matter of inclusion, I respectfully disagree. Even those who object to TEC's direction agree that the LBGT are welcome and included in the church. It's a matter of whether it is appropriate for them to be in leadership roles since the Bible clearly states their actions as a sin. There are clearly other issues such as a disregard for scripture (not just as it relates to LBGT)that are in play here. In my opinion, TEC are the ones not being inclusive by not having consideration for those hold to biblical standards and who are not influenced by the culture. They don't seem to be welcoming those who disagree with them and refer to them as homophobic, bigoted or ignorant (or many other names I've seen). Keep in mind that the majority of the communion does not conform to the culture but work to transform it. I will save time for any revisionists out there. They would simply say they are for "full inclusion". If every door is not open they consider it equal to apartheid. I disagree with that premise but they've battered me so long with their arguments I can at least faithfully parrot them back. What happens if CANA loses in its appeal next month? ultimately, nothing of significance happens if CANA loses appeals or buildings....TEC can get more buildings....but still, so few Americans turn up - wonder why when TEC thinks it is so intelligent and such a brave symbol of justice in the world....why can't it persuade only so few Americans to come along? CANA is not the party making the appeal - TEC/DioVA are. If the VA Supremes rule in TEC's favor, then the case can be appealed to the US Supreme Ct by the VA churches. If the US Supremes support TEC, then it's on to the next phase which is who owns and paid for the property. Hint: it's not TEC/DioVA. The point is that the ruling of the VA Supremes is not necessarily the end of the legal struggle. Your comments reflect a kind and wise spirit. Thank you for providing this blog and all the exchange of information it allows. Communion and, while I am a novice in Integral work, will proceed with attempting it. I hope you might do so as well. "What is important for us to remember is that we should not harden our heart - even toward the prodigals among us." I'm not willing to make the comparison between the prodigal and TEC leadership. Do you honestly believe they will repent and come home? Now we have the video of the pagan ritual that was performed at Glasspool's consecration. What a risible clown spectacle TEC has become. And I was deleted for calling people who lied to me liars. Friends, before you post - I know you are venting, but before you post just imagine that other commentators are sitting at your table. Just pause and imagine that one other person is sitting at your table, namely - well, you know who I mean. I agree with Anonymous at 4:33. The church has, if anything, become a LESS inclusive place than ever before. It's pretty much restricted now to those who espouse radical left-wing politics. Conservatives, traditionalists and centrists need not apply. what does "politics" have to do with it? Are you talking about secular politics or church politics (much as I hate to admit there is any such thing as the latter category)?